An Employee Savings Plan (ESP) will allow company employees to contribute a percentage of their eligible basic salary pay for providing an important source of personal saving and encourage a long-term employment with a company. The ESP makes it easy for employees to save by offering features such matching contributions during the investment period. The employee has the option to choose his/her contribution to a fixed percentage (1% to 20%) of their monthly basic salary. Changes to these percentages (increase or decrease) should be allowed once every year during an employee participation in the plan and can occur on the same enrollment date. The monthly basic salary does not include overtime, bonus, allowances or any other benefits. The table below outlines the percentage amount of a company contribution as of the enrollment date. To move to a higher bracket of a company contribution, you must complete a full year continuous contribution on the date of your enrollment in the plan. 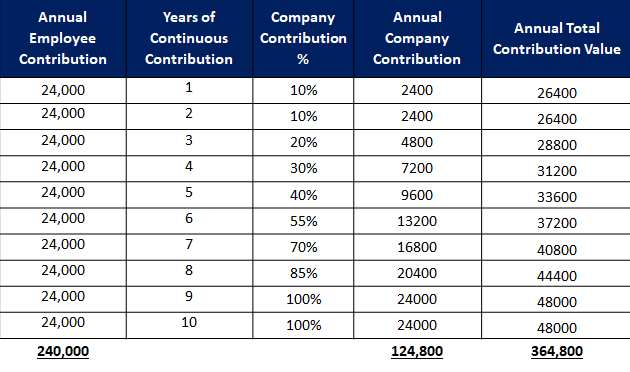 The table below outlines the eligibility of a company contribution share. A company will stop an employee contribution once they have reached retirement age. If an employee voluntary resigns after completing five (5) continuous contribution years, they will receive their total contribution made during the plan and company contribution for the same period. If an employee voluntary resigns prior to completing five (5) continuous contribution years, they will only receive their total contribution made during the plan period. Sarah joined a company on 01 Jan. 2013 and she decided to enroll in the Employee Saving Plan on 01 April 2013 with a monthly contribution of 10% of her monthly basic salary. Her basic salary is SR. 20,000 and she continued in the Employee Saving Plan for ten (10) continuous contribution years.